The car is a monocoque made of carbon fiber, a material that delivered stiffness and strength. Everything about the 4C is about saving weight. Even the windshield and side window glass are 10 percent thinner for a weight savings of up to 15 percent. There is no park gear, just neutral, drive, reverse and manual to bring the paddle shifters into play. But there is a parking brake. These “gears” are buttons mounted in a diamond on the center console. The two seats have carbon fiber and fiberglass reinforced composite frames. They have very nice cloth seat cushions and seat backs. Of course, the car has a manual tilt telescoping steering wheel, but creature comforts kind of end there. There is no power steering, and we realized that as soon as we tried to turn the flat bottomed steering wheel while the 4C was standing still. In other words, the Alfa Romeo dumped the weight of a hydraulic or an electric power steering system. The audio system is pretty rudimentary too. This test model had no satellite radio, no CD player and no USB jack. Although there was an auxiliary jack and a slot for an SD card, there was no navigation system either. And the sheet metal, well, it’s not exactly metal. Alfa Romeo says that attached to the 4C’s monocoque are front and rear cell structures, roof reinforcements and an engine-mounting frame made from lightweight aluminum. The bodywork is SMC (sheet molding compound), a composite that’s 20 percent lighter but more rigid than steel. It was used on the 4C to create the swerves and curves that makes the car even more distinctive than just its diminutive size. The fascia and rear spoiler are made of injected polyurethane. What appeared to be the CPU or audio system controller popped out of the dash and it looked more like a small point-and-shoot camera. Did I say this was a different kind of car? If you care about creature comforts, then the Alfa Romeo 4C is not for you, trust me. But if you care about fun, the 4C has it to spare. As with all fun cars, the good times start with the engine. In this case, it was a mid-mounted 1.7 liter direct injected turbocharged four cylinder aluminum engine that made 237 horsepower and 258 pound-feet of torque. Alfa Romeo said, “A new generation turbocharger features a pulse-converter exhaust manifold to exploit pressure waves and boost torque at low-engine speeds. A waste gate valve adjusts turbo pressure and improves the engine’s efficiency. 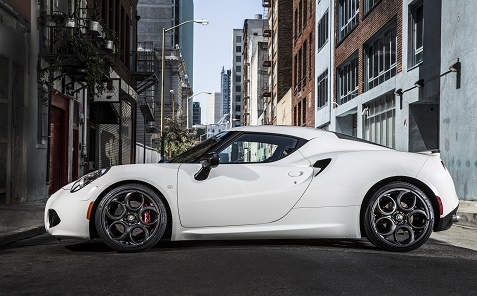 Advanced scavenging technology enables the Alfa Romeo 4C to maximize torque at low engine speeds and deliver more response to driver input by increasing combustion efficiency and turbine speed, all while eliminating turbo lag. As a result, torque delivery is instantaneous, with a peak of 258 ft.-lb. (350 Nm); 80 percent of which is available at only 1,700 rpm. Weighing less than 2,500 lbs., the Alfa Romeo 4C can get to 60 mph from a standstill in 4.3 seconds. It has a top speed of 160 mph and has an amazing curb weight to power ratio of 10.4 lbs. to every one horsepower. And praise to the highway spirits, the thing was fuel efficient. It has an EPA rating of 24 mpg in the city, 34 mpg on the highway and 28 mpg combined. In English, the 4C is exceptionally fast. Once, I aggressively accelerated from in front of my driveway and the car reached more than 50 mph three or four driveways down the street. No matter the speed I was traveling at, every push on the accelerator brought titillation. I couldn’t let the rear-wheel-drive Alfa Romeo 4C even get close to getting loose on surface streets; it was just too fast. The manual rack and pinion steering translated driver input instantly. The car’s suspension let me feel exactly what was transpiring between vehicle and road. And the aural experience was even more vivid, because I could see the engine out of the corner of our right eye through the polyurethane wall separating its mid-mounted compartment from the cockpit which was surprisingly spacious. Again, this is a different kind of car. But it is seasonal; I can’t image driving the Alfa 4C during winter months in climates where there is a real winter; you know, snow, slush, ice that sort of stuff. Only 1,000 Alfa Romeo 4Cs will be sold in the North American market annually. And it is a safe bet that with a base price of $53,900, Alfa Romeo won’t have a problem selling every last one of them. Our tester with options and freight charge was $60,195.